Once upon a time, I was that eight year old dragging my mom into the Sanrio store in the mall, asking for every kind of pen, pencil case and accessory possible. Now I’m not going to lie, if I see a Sanrio store now, I’m probably going in for the sake of nostalgia… and okay probably going to buy one office supply. Suffice it so say, gone are the days when I felt I absolutely needed to collect an item for every single Sanrio character or all the Lisa Frank folders. Then a few days ago with a single tweet, Sanrio introduced Aggretsuko, and I suddenly felt like my eight-year old self again. 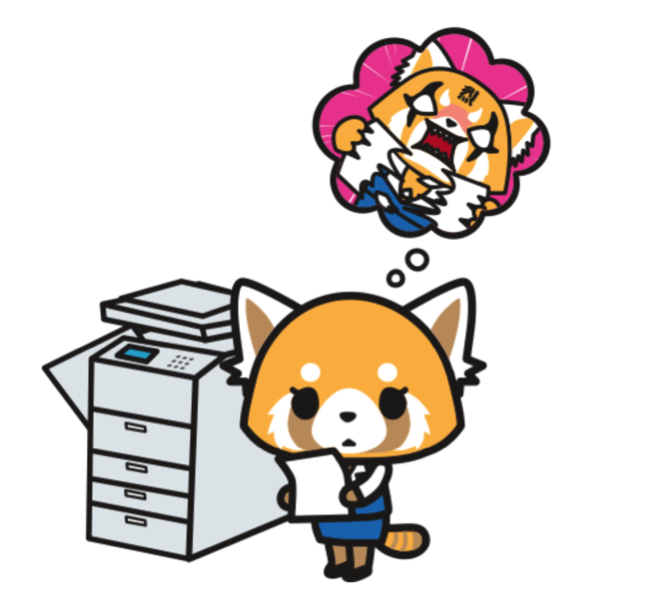 At first sight, Aggretsuko is like any other Sanrio character. She’s a 25-year old adorable-looking red panda (only the cutest animal of all time, in my opinion) who works as an office associate in an accounting department at a firm in Tokyo. That definitely sounds like a good amount of character development for a Japanese product company’s mascot, but what’s amazing about Aggretsuko is that she’s Sanrio’s first Jekyll and Hyde-type character, quickly transitioning from adorable to aggressive. 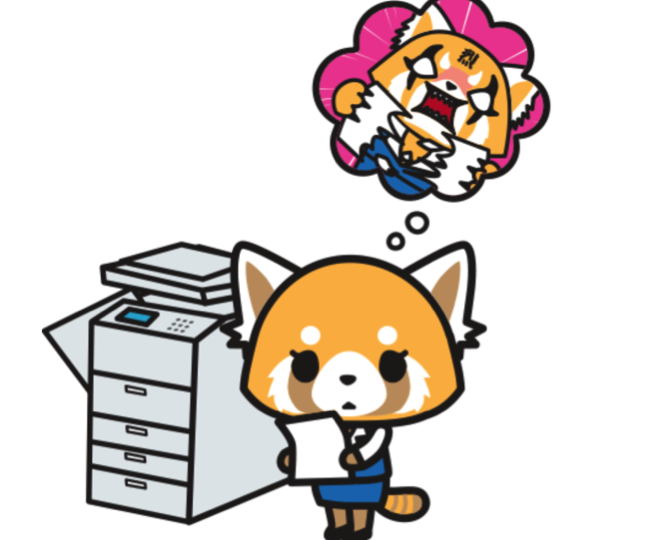 Although Aggretsuko’s dreamed of working as an accountant, she consistently gets swamped at her job with her bosses giving her severe and unsympathetic deadlines. This pushes Aggretsuko to her limit and after work, she gets out all of her pent up rage through some therapeutic heavy metal karaoke and a good ol’ pint of beer. 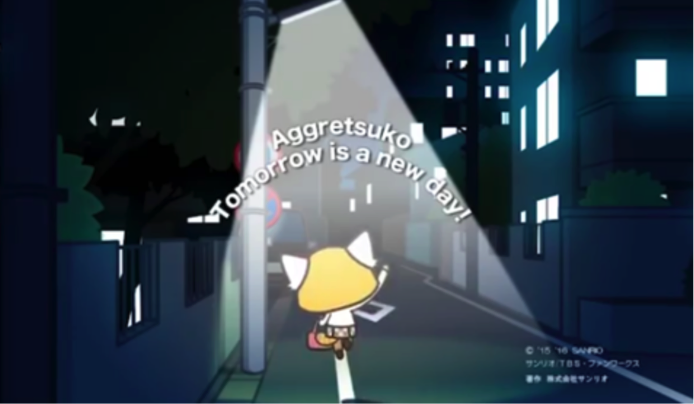 So basically, Aggretsuko is just a young twentysomething year old experiencing city life; talk about relatable. Don’t get us wrong, we love our work here at Delucchi and don’t feel the kind of rage Aggretsuko does, but we do get down with some after-work karaoke and beer. Just ask our copywriter, Caroline. It’s clear that Sanrio has, as of late, been trying to capitalize on having their mascots resonate more with people by tapping into human complexities, making their characters more flawed and relatable. Unlike Hello Kitty or Little Twin Stars, characters like Aggretsuko and the newer and lazy, Gudetama, use typically negative attributes as selling points. This shift is a complete deviation from Sanrio’s typical sunshine and rainbows brand approach. Obviously, Aggretsuko and Gudetama are extremes, but their evident flaws show that it’s okay to not always be perfect. On a more positive note, it’s good to see they send motivating messages to anyone who’s feeling the slightest bit of stress.